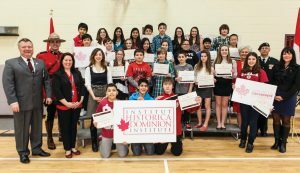 The Canadian Citizenship Challenge (CCC), run by the non-profit Historica Canada organization, teaches the country’s youth about Canada’s history and identity. Members of the CCC team visited Halifax earlier this year to present an award to the student winners of their contest. On behalf of the team, CCC’s Elise Cotter reports on lessons learned. We often hear comments to the effect that the majority of young Canadians have little interest in social and political issues. Because of that, we are told, they don’t see any point in voting and as a result, they don’t. But is that always true? At Historica Canada’s Canadian Citizenship Challenge, we regularly push young people to learn more about Canadian democracy—and very often, we are delighted by the results. Historica Canada (formerly The HistoricaDominion Institute) is the largest independent body in the country dedicated to Canadian history, identity and citizenship. Our Challenge program tests the national knowledge of our youth in challenging them to study for and then write a mock citizenship exam. Last year, more than 44,000 students took the Challenge. The Classroom Grand Prize was awarded to Kelly Murray’s Grade Seven class at Park West School in Halifax. As one of the CCC team who was fortunate enough to be there, I was thrilled to see how intently the winning students listened to the Hon. Myra Freeman, a member of our Board of Directors and former lieutenant-governor of Nova Scotia, when she spoke during the special Citizenship Ceremony. They were clearly excited to take part in yet another education activity, proud of their knowledge of Canada—and even more proud of Canada! It was a reminder to all of our team that we shouldn’t accept the notion that young Canadians are apathetic about social issues and politics. Some, as we saw at Park West School, are very passionate about their country. Others simply need a chance to learn. Our program, for example, asks youth to explore the people, events and factors that shape Canadian democracy, and in doing so, it encourages them to be informed, purposeful and active. Young Canadians won’t always be young. Now, and in future, they face the question “What kind of country do I want Canada to be?” They have the power to answer that question—if they choose to do so—by getting involved in their communities, and letting their opinions be known. If they don’t do that, what is the alternative? Losing Canada’s democratic principles? As we saw in Halifax—and often see in similar situations across the country—that dire future doesn’t have to be the case. A democracy is at its most healthy when young people are engaged in it—and its participants are happier as well. With knowledge comes pride—and with pride comes action. Elise Cotter is the Program Officer at Historica Canada.